The Shooks family farm has seen many changes since its humble beginnings in 1914. Vet and Tena Shooks began by purchasing 50 acres and steadily purchased additional acreage as it became available. Some of the earliest crops grown on their farm were seed potatoes as well as a few acres of tart cherries. Vet soon began feeding dairy cattle as well as hogs and chickens. In 1946 two of Vets sons, Versal and Marvin, became partners in the farm. Under their leadership the farm continued to expand. Dairy cattle were replaced with beef cattle, and potatoes were dropped in favor of more fruit trees. In the 1970s the next generation of the Shooks family, Bryan, Dale and Daryl began farming full time with their parents. 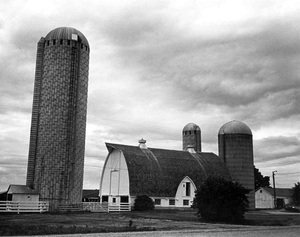 In 1987 the farm was purchased by the three sons and continued that way until the passing of Dale in 2005. Since that time the farm is owned by Bryan and Daryl. Dale's sons RJ and Jon as well as Daryl sons Greg and Rob currently work on the farm full time with Daryl and Bryan.